Multi level marketing business performs various financial transactions using the banking services to issue funds for their customers, MLM network leaders, MLM networkers. MLM networkers also mutually transfer the funds and e-pins to other networkers in their down-liner or up-liner using the customer Panel of MLM Software. MLM Software India provides an extra ordinary feature in Mobile Banking Software to perform these operations using Mobile Banking. 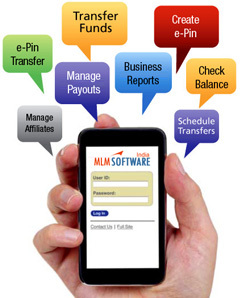 Through Mobile Banking a networker can transfer funds to other MLM leaders or networker using own mobile device. The MLM leaders also can transfer e-pins to others using mobile in their own circle or group.